Confetti Cakes is run by Nicky Fendt, who has been creating exquisite celebrations cakes for over ten years. 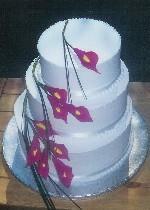 Nicky believes that finely made, beautifully crafted celebration cakes should be available at realistic prices. Using only the very finest ingredients, great skill and artistry Nicky creates the most wonderfulcakes which will add that extra touch to a very special day. She can has an extensive portfolio, some of which can be viewed by browsing the galleries on this website, or she can design your own unique sugar creation, especially for your special celebration. Hand made sugar models and flowers are can be created, to provide you with an unusual memento of your day. Based in the historic market town of Tewkesbury, Gloucestershire, on the edge of the Cotswolds, Confetti Cakes was established in 1997. We cover a wide area including Tewkesbury, Cheltenham, Gloucester, Worcester, the Cotswolds and beyond, delivering wedding cakes to Gloucestershire,Worcestershire,Herefordshire, the Cotswolds and further.